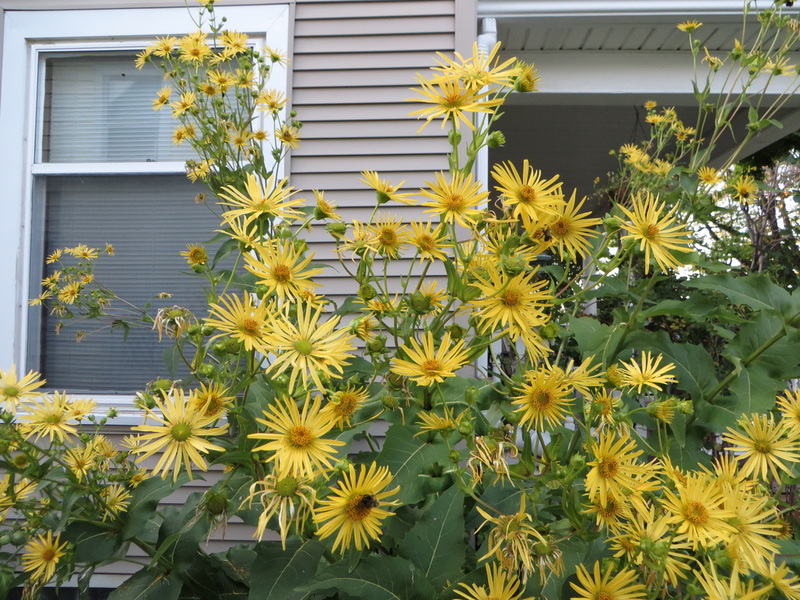 These are the cup plants (Silphium perfoliatum) in my front yard. (If recent downpours didn’t weigh them down so much, they would all be upright and about eight feet tall). They are a native prairie plant in Michigan, and are called cup plant because their opposite leaves fuse at the base around the stem and form a cup that holds water. 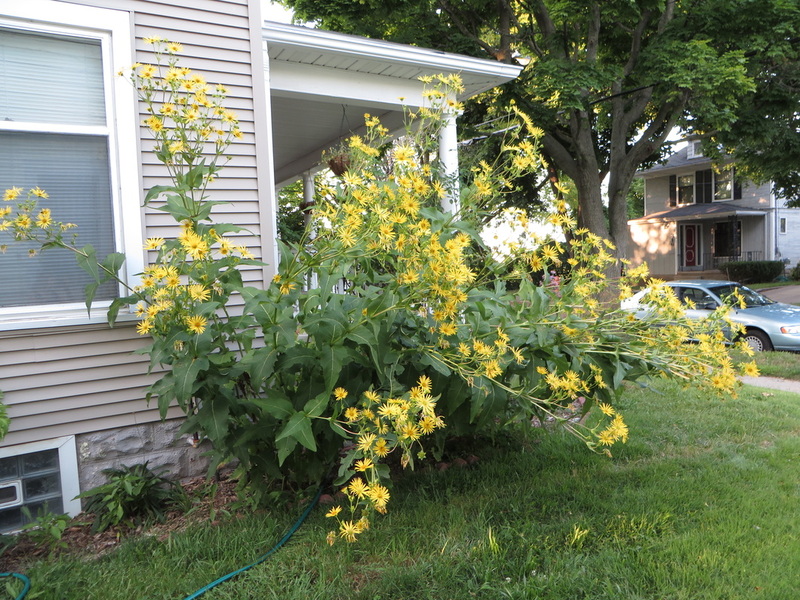 Although I planted them around three years ago, this is the first summer they have grown to their full size and produced so many flowers. It turns out that bees really like my cup plants. In fact, they like them so much that I have counted over 30 bees (mostly bumblebees, my favorite) on the plants at one time! You can see several bees in this picture if you look hard enough. 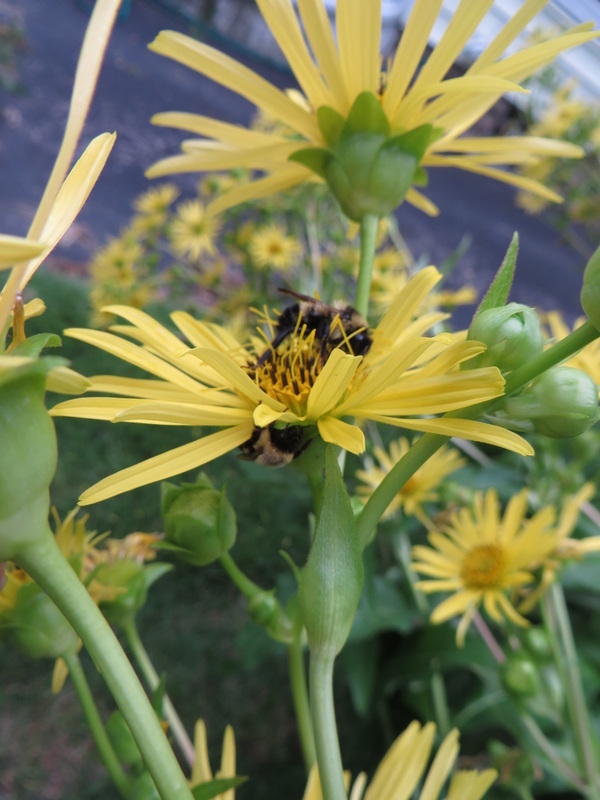 If you live in the Midwest and want to create pollinator habitat in your garden, you should really plant cup plants – the bumblebees are on them all day, every day, while they are flowering. I have seen a couple butterflies nectaring on them, too. One day when I came home after some thunderstorms and was looking at the cup plants, I noticed that although some bumblebees were flying around and feeding from the flowers, others looked like they were hiding from something. The bees were holding on to the base of the flowers, and were not moving. It looked to me like they were taking a nap. My educated guess is they were getting as much shelter as they could from the downpours earlier and decided to stay there and rest the remaining part of the day. It was interesting that some bees were active and others weren’t, though. A bee busy feeding from a flower while one below the flower isn’t bothered at all and continues resting. 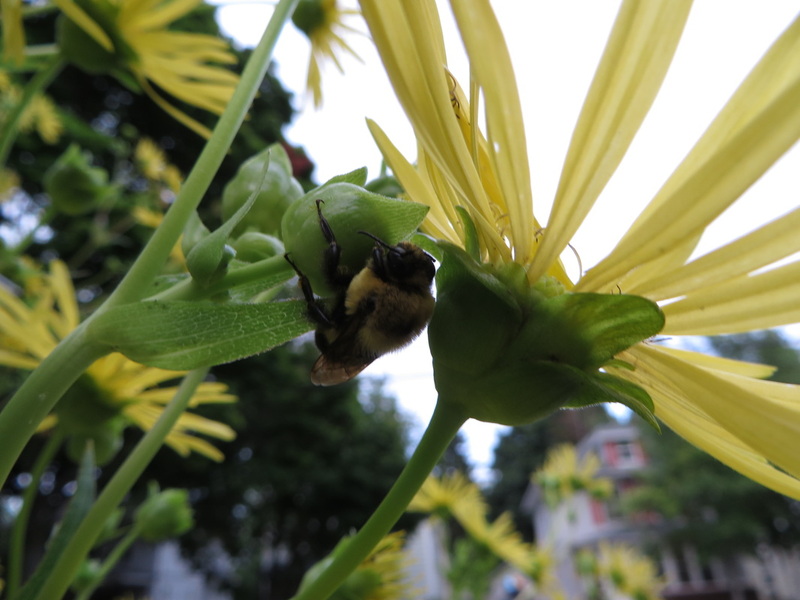 I did a little research online to see if bees take naps, and there are actually quite a few people that have blogged about this after observing the same thing I did. Although I couldn’t find any scientific sources besides Wikipedia, one blogger said she looked this up and found out that female worker bumblebees are more actively looking to feed so they can bring food back to their nest for the queen and larvae (they don’t create as large of colonies as honeybees do), but male bumblebees, once they are mature, do not go back to the nest. Their only purpose is to find a queen to mate with and reproduce. Since they don’t need to bring food back to the nest for other bees, they rest when it starts to get cold and sleep through the night until the sun warms them up in the morning. So this means I probably saw male bumblebees sleeping and female worker bees nectaring on flowers! Pretty cool.